"Josefine's Salon Concept is the best place in town for customer service. We were very happy with the service." When Jennifer Gray smiles, her eyes twinkle and it looks like she knows something; within her lies the answer to a simple yet abstract concept: happiness. Looking at her work is like looking directly into a feeling rather than a subject. She uses acrylic paint on canvas or wood and pastels on butcher paper. The final step is usually an epoxy or varnish to bring out the hidden brightness. She also creates free-standing sculptures: curvy women with missing parts made of wood, wire and paper made solid by thick coats of hardening mediums. Gray grew up in California. An awkward kid who did not fit in, art was her solace. Worried about how she would support herself through college, Gray attended beauty school while still in high school. In her senior year, she dropped out of beauty school to participate in track, and then it was on to college to study accounting, which she hated. Instead, she focused on art classes, where she learned to handle an array of mediums. Gray married a man in the Air Force and moved to the Spokane area after he was stationed at Fairchild. Gray worked at a downtown salon for 10 years as she continued to create art. 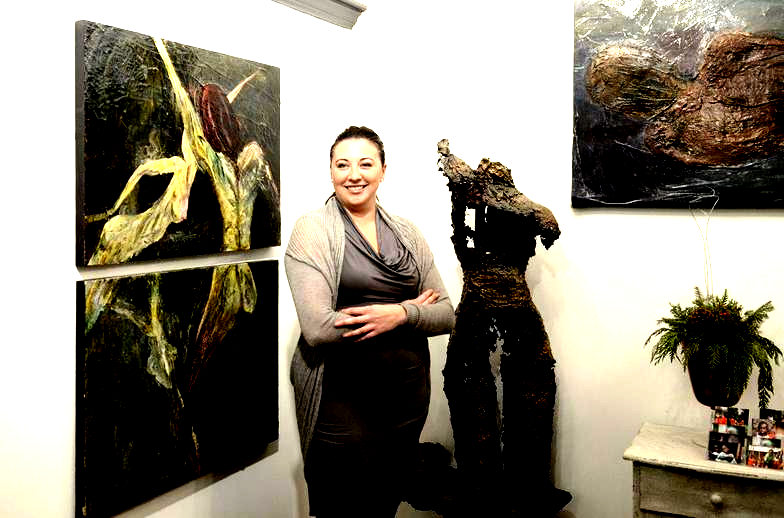 Fast-forward to now: She is divorced and working in her own shop called Josefine’s Salon Concepts at 154 S. Madison St. Josefine was her great-grandmother’s name and it is a place where Gray can fully immerse herself in the creative spirit; artwork is scattered around as she paints and sculpts hair.